University of Phoenix Stadium, opened August 1, 2006, is a multipurpose football stadium located in Glendale, Arizona, west of Phoenix. It is the home of the Arizona Cardinals of the National Football League (NFL) and the annual Fiesta Bowl, and replaced Tempe‘s Sun Devil Stadium as the Valley of the Sun‘s main outdoor stadium. The stadium is adjacent to the Gila River Arena and it features the first fully retractable natural grass playing surface built in the United States on top of an AirField Systems Drainage System. An opening on one side of the stadium allows the playing field to move to the exterior of the building, allowing the entire natural turf playing surface to be exposed to daylight and also allowing the floor of the stadium to be used for any other purpose (such as seating for concerts) without damaging the turf. The stadium has hosted the Fiesta Bowl, the 2007 BCS National Championship Game, 2011 BCS National Championship Game and 2016 College Football Playoff National Championship a game that it hosted every four years, which set the venue’s entertainment attendance record of 78,603 on January 11, 2011, 2008 Super Bowl XLII, 2015 Super Bowl XLIX, the 2015 Pro Bowl, WrestleMania XXVI, and matches from the 2015 CONCACAF Gold Cup. It was one of the stadiums for the Copa América Centenario in 2016, with one of those matches being the 3rd place final, and will host the NCAA Final Four in 2017. The University of Phoenix acquired the naming rights in September 2006, shortly after the stadium had opened under the name Cardinals Stadium. The “University of Phoenix” name is applied as a corporate sponsor, and not as the home stadium of the university, which has no intercollegiate athletics program. Since moving to Arizona in 1988, the Cardinals had played at Sun Devil Stadium on the campus of Arizona State University. 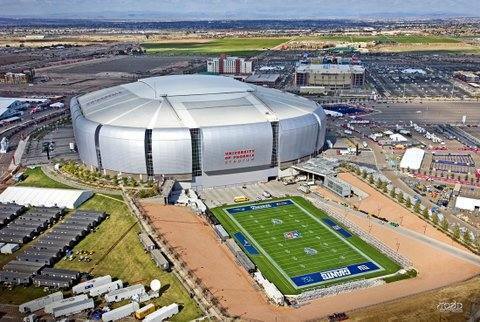 The Cardinals had only planned to play there until a new stadium could be built in Phoenix. However, the savings and loan crisis derailed funding for a new stadium. Over time, the Cardinals expressed frustration at being merely tenants in a college football stadium. Notably, it denied them access to additional revenue streams available to other NFL teams. The Cardinals campaigned several years for a new and more modern facility. The 63,400-seat stadium opened on August 1, 2006 after three years of construction. The stadium was designed by Eisenman Architects and HOK Sport (now Populous). The stadium is considered an architectural icon for the region and was named by Business Week as one of the 10 “most impressive” sports facilities on the globe due to the combination of its retractable roof (engineering design by Walter P Moore) and roll-in natural grass field designed by Lloyd Civil & Sports Engineering (formerly CMX Inc.), similar to the GelreDome and the Veltins-Arena. It is the only American facility on the list. The ceremonial groundbreaking for the new stadium was held on April 12, 2003. LED video and ribbon displays from Daktronics in Brookings, South Dakota were installed in 2006 prior to Arizona’s first game of the season. The cost of the project was $455 million. That total included $395.4 million for the stadium, $41.7 million for site improvements, and $17.8 million for the land. Contributors to the stadium included the Arizona Sports and Tourism Authority($302.3 million), the Arizona Cardinals ($143.2 million), and the City of Glendale ($9.5 million). The 25 acres (10 ha) surrounding the stadium is called Sportsman’s Park. Included within the Park is an 8-acre (3.2 ha) landscaped tailgating area called the Great Lawn. The stadium seating capacity can be expanded by 8,800 for “mega-events” such as college bowls, NFL Super Bowls, and the NFC Championship Game by adding risers and ganged, portable “X-frame” folding seats. The endzone area on the side of the facility where the field tray rolls in and out of the facility can be expanded to accommodate the additional seats. The roof is made out of translucent “Bird-Air” fabric and opens in 12 minutes. It is the first retractable roof ever built on an incline.